ISS recently released its policy updates for the 2015 proxy season (Meridian summaries here and here). One notable change is ISS’s methodology for selecting peers for energy companies for use in its pay for performance analysis. This change was likely driven by a group of upstream E&P energy companies that lobbied ISS. Historically, ISS selected energy industry peer groups based on industry (GICS classification), revenue, and market cap, with revenue as the primary measure of size. A group of E&P companies argued that revenue was a poor indicator of size for E&P companies, and even worse when comparing E&P with other energy companies (midstream, downstream, etc.). Additionally, this group educated ISS on the differences in business models within the energy industry and the different factors that influence the various industry segments. 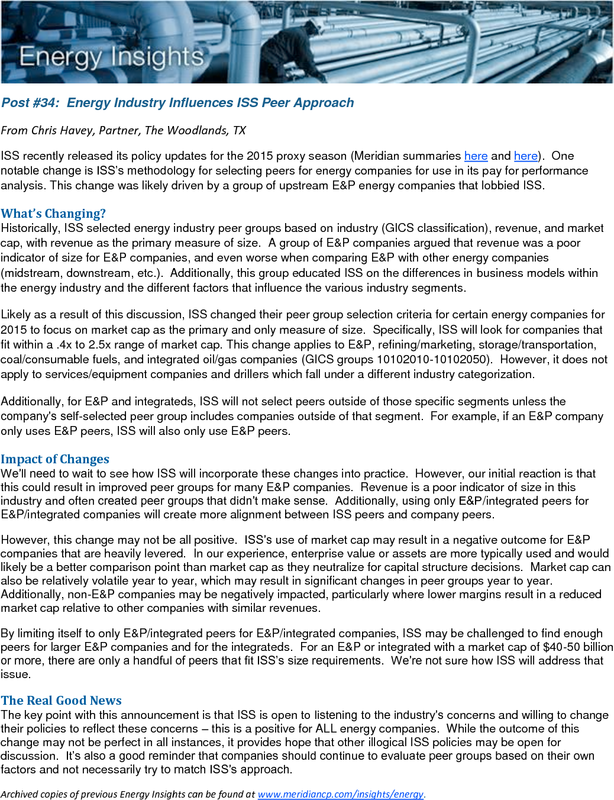 Likely as a result of this discussion, ISS changed their peer group selection criteria for certain energy companies for 2015 to focus on market cap as the primary and only measure of size. Specifically, ISS will look for companies that fit within a .4x to 2.5x range of market cap. This change applies to E&P, refining/marketing, storage/transportation, coal/consumable fuels, and integrated oil/gas companies (GICS groups 10102010-10102050). However, it does not apply to services/equipment companies and drillers which fall under a different industry categorization. Additionally, for E&P and integrateds, ISS will not select peers outside of those specific segments unless the company’s self-selected peer group includes companies outside of that segment. For example, if an E&P company only uses E&P peers, ISS will also only use E&P peers. We’ll need to wait to see how ISS will incorporate these changes into practice. However, our initial reaction is that this could result in improved peer groups for many E&P companies. Revenue is a poor indicator of size in this industry and often created peer groups that didn’t make sense. Additionally, using only E&P/integrated peers for E&P/integrated companies will create more alignment between ISS peers and company peers. However, this change may not be all positive. ISS’s use of market cap may result in a negative outcome for E&P companies that are heavily levered. 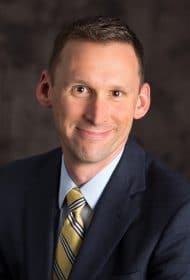 In our experience, enterprise value or assets are more typically used and would likely be a better comparison point than market cap as they neutralize for capital structure decisions. Market cap can also be relatively volatile year to year, which may result in significant changes in peer groups year to year. Additionally, non-E&P companies may be negatively impacted, particularly where lower margins result in a reduced market cap relative to other companies with similar revenues. By limiting itself to only E&P/integrated peers for E&P/integrated companies, ISS may be challenged to find enough peers for larger E&P companies and for the integrateds. For an E&P or integrated with a market cap of $40-50 billion or more, there are only a handful of peers that fit ISS’s size requirements. We’re not sure how ISS will address that issue. The key point with this announcement is that ISS is open to listening to the industry’s concerns and willing to change their policies to reflect these concerns – this is a positive for ALL energy companies. While the outcome of this change may not be perfect in all instances, it provides hope that other illogical ISS policies may be open for discussion. It’s also a good reminder that companies should continue to evaluate peer groups based on their own factors and not necessarily try to match ISS’s approach.